Is your organization investing in Global Competence? The first part defines how the shift in economic environment is forcing Western multinationals to take notice of global competition. Rival companies from emerging economies and the tech sector are entering the markets and are taking advantage of the opportunities in ways that Western companies struggle to match. Global competition forces multinationals to be strategically agile, to be informed about emerging markets and seek out long-term strategies. The article warns that vigilance, agility and optimism are the core characteristics that made great companies and that it’s time for established multinational organizations to start feeling uncomfortable enough again to work on these characteristics. The second part is about people; about having a global workforce and about the challenges of working across many cultures while norms and values are still dictated by the local market. The article describes how “cultural potholes” are created when a global organization is not able to manage culture in the workplace; whether it failing to implement the corporate culture across the board or simply ignoring cultural differences. It also describes an approach to better communication, understanding and trust in global teams. The final article is about the individual cultural competence and how this can be shaped by looking at culture as a relevant concept, rather than an abstract one. Being competitive in a global market means that your global communications is no longer a one-way street. Market information and data is becoming an intellectual asset and the larger organizations are taking innovative ways to access the markets. Low level maturity organizations will mostly be reactive to outside market forces, whereas high level maturity organizations will have a systematic process in place to collect and communicate information from all directions. Organizations go through considerable growing pains before they really have to make an investment in processes and technology. However, organizations should take advantage by learning from the Ad-hoc and Conscious stages to prepare their organization for the inevitable growing global competition. Purely looking at content strategy, organizations will need to be agile enough to react on foreign language information that is available. 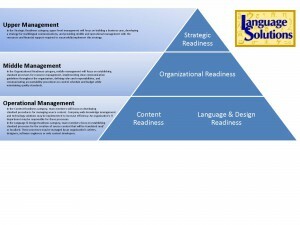 Organizations that have matured on the Global Communication Maturity Model are able to make use of best practices, such as machine translation, content management or emerging communication technologies to translate ad-hoc information, while having processes in place to handle large volumes of high-level information to be translated effectively and at high quality. This takes considerable investment in technology, people and processes. Content management best practices in the traditional maturation model are not easily adopted. Newer organizations are able to make use of innovative and emerging technologies as they don’t have a defined infrastructure that they rely on yet. It will take a lot more commitment and groundwork for a traditional multinational organization to bring these efficiencies to their existing processes. Early maturation in global communication processes prepares organizations to have a global mindset that will help them to compete in the global marketplace. Now you can take the Localization Maturity Online Assessment to find out where you are on the Maturity Map, discover your risks and how we can help you. A successful Global Workforce is a product of good leadership and inclusiveness. But organizations tend to thrive on a high level of cultural bias towards their own beliefs, rather than the local customs. Many organizations have a clear mentality towards how they want to operate; they just have not thought about how to include everyone into their culture. As in this current publication and previous publications, the role of HR will more evolved around managing the task of bringing together an ever increasing diverse global workforce. 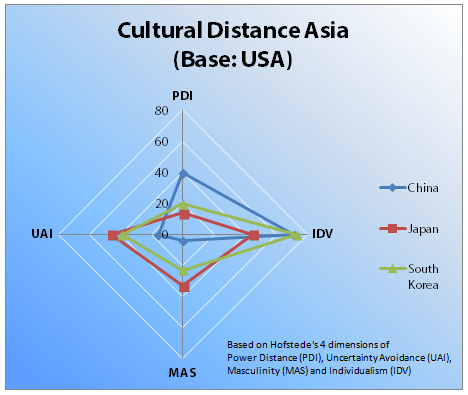 A visual representation of the absolute difference between the Asian cultures and the US, as measured by the 4 cultural dimensions by Hofstede. These graphics can help understand at early stages where in the communication process there is a possibility of a breakdown. By analyzing your messaging and communication practices from these or other dimensions, an organization can take first steps into becoming more globally competent. Companies that already have started to form their global communications around cultural dimensions will understand how they can learn and adapt their approach towards being more inclusive. 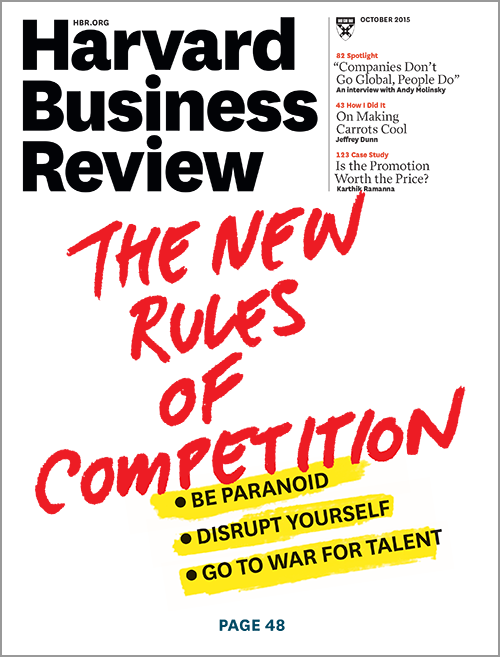 Experience counts in this matter, as HBR highlights in several examples where organizations are learning from their mistakes early on. This is also the case for translation. Many HR organizations tend to develop programs from within their corporate norms and beliefs, only for that to be then translated into another language once the program is pretty much ready to be rolled out. 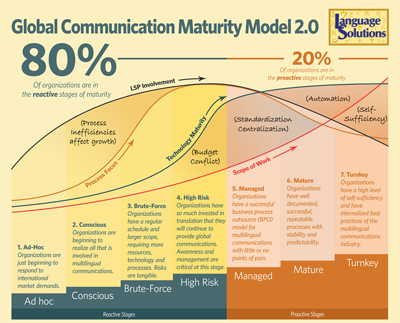 In our own research towards maturation in global communications, this “ad-hoc” stage is very much the way we see many organizations starting out and many organizations tend to stick in the reactive stages of maturation. Companies can learn from their growing pains by taking a systematic approach towards cultural differences. As the article mentions, the process starts with understanding the differences that exist and why these exists. There are studies out there regarding Cultural Dimensions (for example this great analysis of advertising in Canada and the US) and we encourage companies in early stages of maturation to look for the messaging that is affected by these dimensions. Knowing this concept allows the organization to think of these nuances ahead of time, and either homogenize the content to include a wider audience or be more selective about how they approach these other regions. 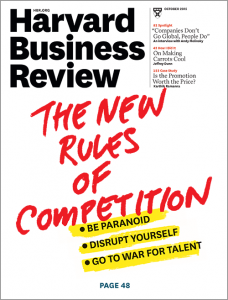 One great lesson in the HBR article “Companies don’t go global, people do” is that an organization should never lose focus on the importance of supporting their people’s global skills. When organizations start out with global communications, often there is no such thing as a “global manager”. There is no global. When an individual is tasked to manage the internal process of getting materials translated into another language, there is a huge potential for learning. However, most often this process is seen as an arbitrary addition to the task they were given when they were hired for the job. The danger of any organization is to prioritize the “now” and not focus on the future. 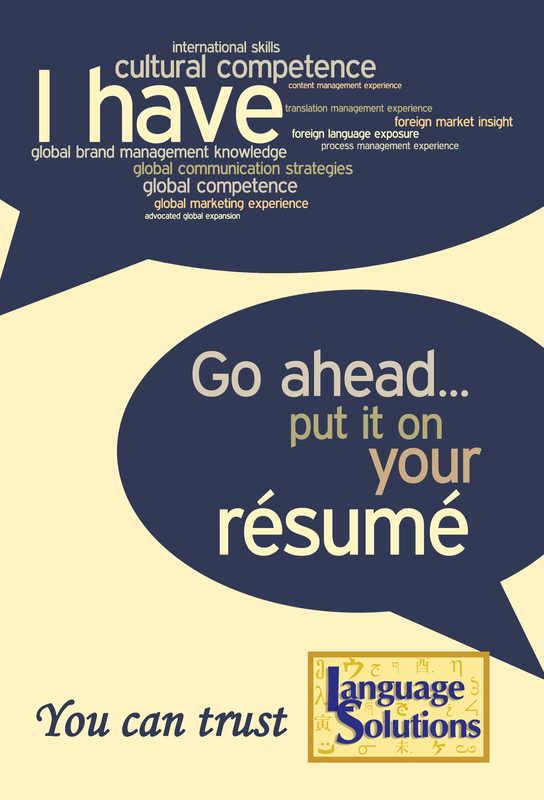 While you may never have thought of putting global manager on your résumé, an organization should be mindful of the fact that once you go global, it’s probably going to be for the long run. And with the global competition rising and the need for new organizations to be instantly global, one can see how it can be a win-win situation for organizations to invest in global competency skills, whether it is by developing global skills from within or by focusing hiring practices on bringing in more “cosmopolitans” that can influence the rest of the workforce (as suggested in HBR). Early adoption and maturation into a more globally minded organization should be thought of as a leading indicator of success on the global marketplace. Start building your global competence from the ground up, by incorporating processes at operational management. These processes are affected early on in maturation. Our plight: Organizations can’t afford to ignore early adoption of the global maturation process! Organizations that take on a proactive approach to Global Communications Maturation are better positioned to take on the challenges of growing global competition. Traditional organizations tend to stick with what they know best domestically as they expand globally. The early stages of maturation should be seen as an opportunity of learning and growth. 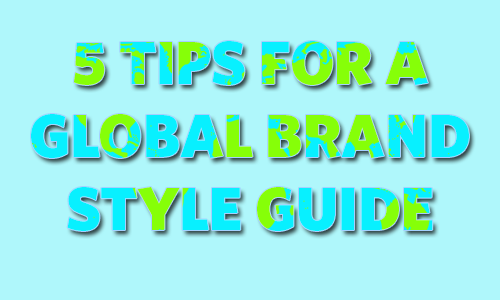 Organizations that are “born global” are better positioned to take on these challenges as global instantly becomes the fabric of their existence and therefore of strategic importance. Traditional organizations need to take advantage of their global practices by learning from their mistakes and bringing in systematic improvements early on. Too often we find that the scope of translation doesn’t carry enough weight in the organization to think more strategically, causing processes to linger on as they were while they grow as a global organization. However, this causes the organization to miss opportunities in building a globally competent workforce. It also hinders companies to learn from their mistakes and building important intellectual assets and processes that can help them to be more prepared for the challenges ahead. Your language service provider should be a partner in helping you and your organization to be more globally competent. If not, give us a call. The customer is our focus. You can read more here about how we can help you.